Aimery and I do a lot of traveling together - we are always going somewhere! Over the last two months, we did two international trips to Canada to visit Aimery's father. We have decided that right now it's best if Aimery and I travel up to Canada together for visits. After our last weekend visit, I'm pretty confident that I (kind of) know what I'm doing while traveling with a toddler! But let me just say, traveling with a toddler is NOT easy. And doing it alone? Almost impossible. Keep reading to find ways to make traveling less stressful for both yourself and your little one. Before you book your flight, be sure to check if the airline is a good fit for you. 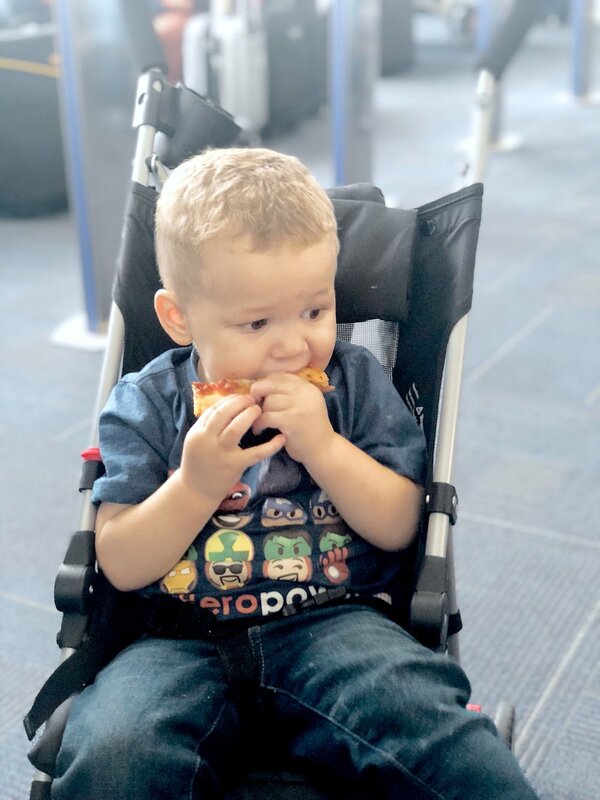 Some airlines have different rules and regulations for traveling with an infant, like your allowance of what you are able to check for free (car seat, stroller, Pack 'n Play, etc.). Also, before booking your flight, make sure the time of the flight works well with your little one's schedule. When flying internationally, flights that leave around 1PM always work best for us. This allows Aimery to wake up at normal time in the morning and give me time to get us out the door before making our two hour road trip to the airport, and still giving us 2-3 hours at the airport before our flight. Plus, I like Aimery to nap on the plane, so a flight around 1PM is perfect! Also take note that airports are normally packed on week day mornings with business commuters, so you'll want to avoid booking flights during that time as much as possible. Weekend flights during the early afternoon is the way to go! Wallet with ID, Credit card, and cash. Phone, iPad, Laptop, and one charger. SNACKS. Everything your toddler may eat in a million different ziplock bags so you can toss them at any given moment. If you are a single parent, don't forget court ordered documents (like a custody agreement) and a letter from the other parent, especially if flying out of the country.. Going through security is probably the most stressful part of traveling with a toddler! When you have a partner with you, one person can entertain the little one while the other gets everything taken out of the bags. But when I'm on my own, I'm that crazy mom that's trying to control her two year old while sorting through her backpack for a lost sippy cup... So here are some ways to make security easier! Keep your toddler in the stroller for as long as possible. They will tell you when it's time to take him out, and then direct you to either fold up the stroller or push it through. Children normally aren't required to take off their shoes while going through security, so don't worry about taking his shoes off! Have all the liquids together and easy to access. Before reaching security, I have Aimery's sippy cup and liquid medicine on the outside compartment of my bag so I can easily access them to place in the bin. Once I have those out, next is my ipad/laptop, then the backpack, then shoes off! Read about our trip to Antigua here. 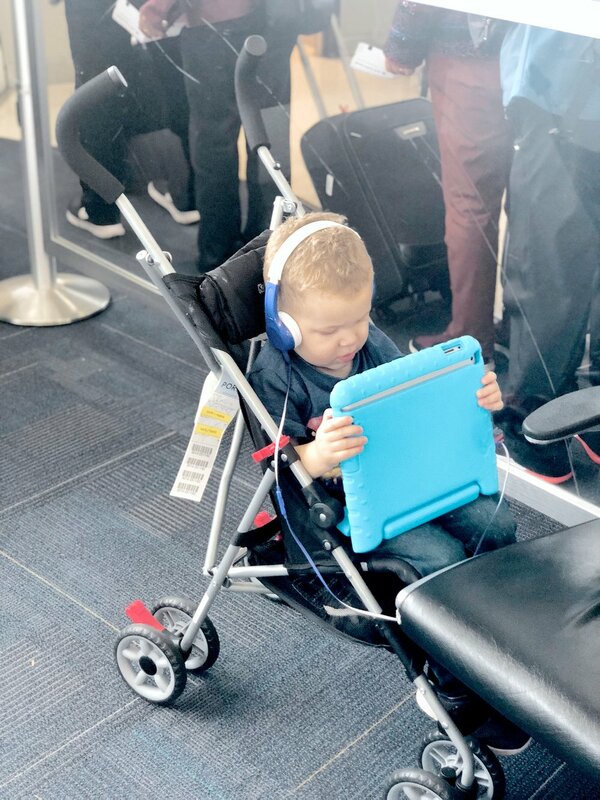 If you have extra time before your flight, that's a great time to plug in your phone/ipad, grab a snack, go for a walk around the airport, and find an empty gate for your toddler to run wild for a bit. Also be sure to take a bathroom break to change diapers before your flight! When Aimery was a baby, I always chose an aisle seat at the back of the plane so I would have easy access to the bathroom or to walk around. Now that Aimery is older (although still a lap-child), I go for a seat by the window to keep him entertained during takeoff/landing. When we reach our gate, I always ask to be boarded last. Normally they try to board families first which is great when you have someone to help get bags put away, but when I'm traveling alone I like Aimery to be able to run around until the last possible minute. Also, be sure to ask if there is space for you to be moved to an empty row. The last time we traveled, we were given numerous rows to ourselves and it was great to have the extra space! It never hurts to ask! Shop Aimery's iPad case here. Since we are the last to board every flight, Aimery can normally keep himself entertained by looking out the window, bothering the people next to us, and looking through magazines until we are up in the air. Once the seatbelt sign is off, I get Aimery set up with a snack, cup, ipad, and headphones and he will normally stay busy for the next 30 minutes or until he falls asleep. Our last flight was delayed 45 minutes AFTER getting on the plane, which definitely threw off our normal travel routine! It left Aimery falling asleep before we even took off. Just understand that while traveling, anything can happen! Did these tips work for you? Comment below your best tips for traveling with little ones!